On September 22, 1984, Helmut Kohl and François Mitterand had joined hands in a symbolic moment at Verdun. As an equivalent to this historic gesture, Helmut Kohl invited U.S. President Ronald Reagan to make a joint visit to the Bitburg Military Cemetery in West Germany. Forty years after the end of the war, this visit was supposed to be a gesture of reconciliation. Approximately 50 members of the Waffen-SS, however, were among the 2,000 soldiers buried in Bitburg, and this fact sparked vehement protests, both in Germany and abroad. 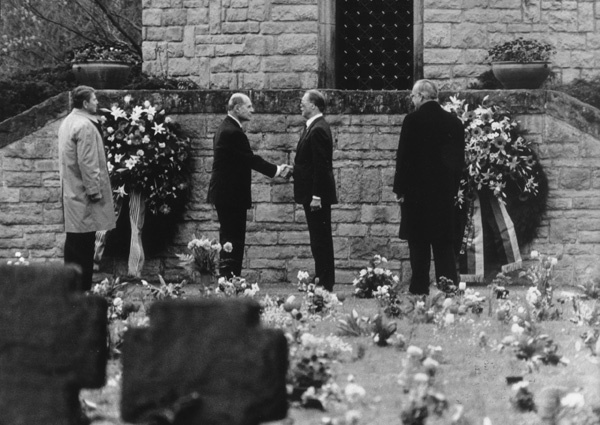 This picture shows (from left to right) President Ronald Reagan, General Matthew B. Ridgway (Commander of the 82nd Paratrooper Division during WW II), General Johannes Steinhoff (Luftwaffe pilot during WW II) and Chancellor Helmut Kohl during a wreath-laying ceremony on May 5, 1985.